Working with academic, federal, and commercial collaborators through the DHS-funded Coastal Resilience Center, RENCI operates and maintains the North Carolina Forecast System, an advanced, autonomous computational system based on the Adcirc Surge Guidance System (ASGS). It runs in near real-time during active tropical cyclones that threaten any part of the US east and Gulf of Mexico coasts. ASGS manages the entire computational process, with its output (water levels, winds, and wave heights) provided to the nc-cera.renci.org web page for dissemination and public access. Data files, including standard model output files and GIS shapefiles, are posted on RENCI public data servers. To broaden the distribution of ADCIRC-based results to a wider audience of users, RENCI has developed a MATLAB-based graphical user interface, called AdcircViz, to provide uniform access to the collection of ASGS forecast outputs. The application helps both ADCIRC experts and decision-makers, including forecasters at the National Hurricane Center (NHC) in Miami, Florida, to see what geographical regions are currently covered by ADCIRC, which systems are running for a specific hurricane forecast advisory, and access, display, and analyze the real-time ADCIRC prediction output. AdcircViz provides consistent display of model results, inter-comparison of time series output at user-selected locations, animation of time-dependent output fields, and export to GIS shape files. The data grid and AdcircViz application can be applied to any model whose output files are CF-UGRID compliant and posted on a THREDDS data server. 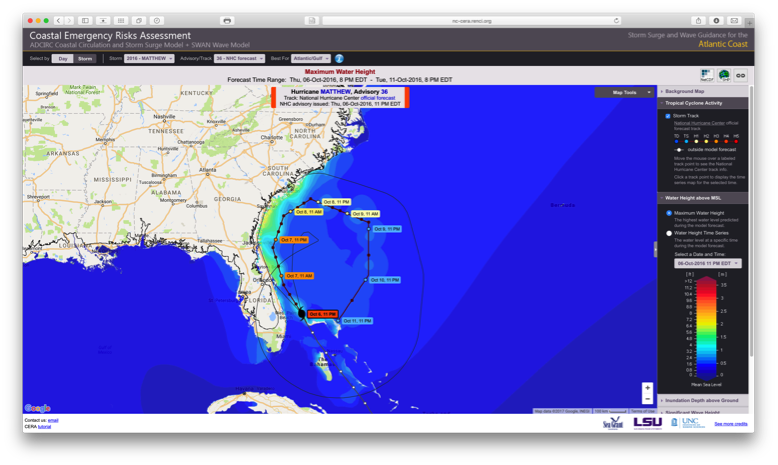 This software will enable the NOAA National Hurricane Center (NHC) to access, display, and analyze ADCIRC-based simulation output. The NHC used ADCIRC model outputs for the first time during the 2014 hurricane season, using AdcircViz. RENCI has developed the AdcircViz application and is working with the National Hurricane Center to enable them to use AdcircViz in their operational storm surge forecasting group. This will allow them to access and use ADCIRC-based storm surge results as additional guidance in their forecast decision making process. While generating precise and accurate storm surge and atmospheric predictions during a tropical cyclone (hurricane) is important, so too is knowing the best way to safely evacuate and shelter the large numbers of people threatened during such events. This project will extend previous research into computer models for evacuation and sheltering plans by incorporating probabilistic ensemble methods to characterize uncertainty in hurricane forecasts. Current evacuation models are used to inform emergency managers on who to evacuate and when, but these models are based primarily on “clearance time,” or ensuring that evacuees are on the roads for the shortest amount of time. The models do not take into account what populations are at most at risk, potential for injury or loss of life, or other social factors. These new models optimize evacuation plans and routes by minimizing the aggregate risk to a coastal population, instead of only minimizing clearance times. The goal is to use a hazard-consistent approach to integrated probabilistic modeling that can be used to inform and improve evacuation models for NC coastal communities. This new modeling will take into account the spatial and physical characteristics of the natural and built environments and the population characteristics of the threatened coastal areas. RENCI’s coastal storm surge modeling work using ADCIRC will form the basis of a comprehensive tropical cyclone impacts modeling system that integrates coastal oceanographic processes with mesoscale meteorological and hydrological processes. This physical modeling system will determine probabilistic water levels, winds, precipitation, and river drainage during emergency events. RENCI supercomputers will be used to compute the models, which will require large compute-resources to support. RENCI will also develop an integrated approach to data management and delivery of model output using the iRODS data management middleware. Urgent and on-time forecasting of potential and imminent disasters is needed in the days and hours before a tropical cyclone (hurricane). To aid decision makers in both pre- and post-disaster efforts, forecast information must be available within the typical forecast cycle, and as early as possible. In the case of coastal storm surge and wave forecasting, the numerical models used for forecasting need to accurately represent both the physical processes and the complexity of the coastal region. This constraint imposes a high spatial and temporal resolution on the model. Consequently, the forecast simulation can be resource-intensive and potentially delay delivery of the needed information beyond the decision making time window. This project will enable rapid coastal hazards assessments by implementing a response surface method for computation of statistical forecasts. The method uses a database of probabilistic hurricanes and storm surge/wave responses computed for the North Carolina Floodplain Mapping Program, which were used to develop the next-generation coast flood insurance rate maps for FEMA.